ANYANG, KOREA, December 07, 2017 /24-7PressRelease/ — 3D Future Co., Ltd., a company specializing in VR contents, completed the VR art performance successfully on November at the CUFESTA event held at the auditorium of Cyber Hankuk University of Foreign Studies. 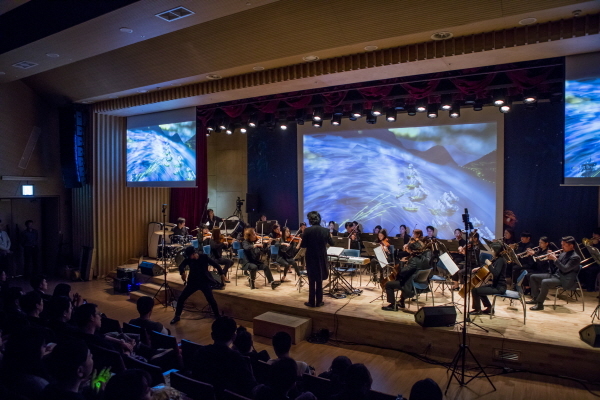 Cyber Hankuk University of Foreign Studies, a future-oriented educational institution, planned a VR art performance with the Seoul Orchestra (conductor Joo-yong Kwon) in order to promote and introduce VR, which is closely related to future cyber education. In line with this, a VR artist Jae-hyuk Lee expressed the value of the university exploring the truth based on the motif of “Pirates of the Caribbean” for over a month by using “Tilt Brush” to express it as a work titled “Eternal Jewelry”. This masterpiece was produced dynamically for about 5 minutes into the magnificent live performance of the Seoul Orchestra, made audiences exclaim and show enthusiastic responses. For reference, “Tilt Brush” is a representative VR art production program made by Google, and Google is currently operating 45 global VR artist residency programs.